This article on the resurrection of Jesus appears at the time of year when we are focusing on His birth, not His death and resurrection. To stop and think about the resurrection may seem like an unnecessary aside to the beautiful story of our Savior’s birth. To think only about the birth of Jesus, however, fails to do justice to the incarnation. It fails to consider the purpose of Jesus’ coming to earth. At the occasion of His birth, the angel said to the shepherds, “For unto you is born this day in the city of David a Savior, who is Christ the Lord” (Luke 2:11). The meaning of Savior is clarified before His birth when the angel instructed Joseph: “You shall call his name Jesus, for he will save his people from their sins” (Matt. 1:21). How will He save His people? Paul answers in 1 Corinthians 15:3: “Christ died for our sins in accordance with the Scriptures.” And on the eve of His crucifixion Jesus Himself said, “But for this purpose I have come to this hour” (John 12:27). As we celebrate His birth, let us keep in mind that He came to die. This article, based on the account in Matthew 28:8–15, focuses, not on His birth or death, but on His resurrection. However, there is actually a seamless connection between the four major events of Jesus’ life: His birth, death, resurrection, and ascension. All four events stand or fall together. At the same time each event had its own unique role to play. What role, then, does the resurrection of Jesus play in the overall story of redemption? There are at least four major truths about the resurrection that teach us about its absolute necessity. First, it proved that Jesus was indeed the divine Son of God. Paul wrote that “[He] was declared to be the Son of God in power according to the Spirit of holiness by his resurrection from the dead” (Rom. 1:4). Actually it was impossible for Jesus’ body to remain in the grave. Just as it was impossible for the divine nature of Jesus to die because God cannot die, so it was impossible for the human nature of Jesus to remain dead because of its union with His divine nature. Peter said on the day of Pentecost: “God raised him up, loosing the pangs of death, because it was not possible for him to be held by it” (Acts 2:24). 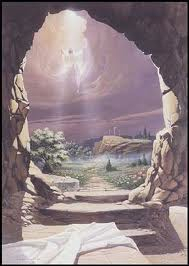 So it was not possible for Jesus’ body to remain in the grave. And in raising Him from the grave, God declared beyond all shadow of doubt that this Jesus whom lawless men crucified was indeed the divine Son of God. Second, the resurrection of Jesus assures us of our justification. Paul wrote, “And if Christ has not been raised, your faith is futile and you are still in your sins” (I Cor. 15:17). If Christ were still in the tomb it would mean God’s wrath was not satisfied, and we would still stand guilty before God. But as Paul also wrote in Romans 4:25: “[Jesus] was delivered up for our trespasses and raised for our justification.” It is not that the resurrection accomplished our justification — Jesus’ sinless life and sin-bearing death did that — but rather it assures us of our justification. It was God the Father who raised Jesus from the dead (Rom. 8:11), and by that act God declared that Christ’s atoning sacrifice had been accepted. The penalty for our sins was paid in full. The resurrection was God’s declaration that He had cancelled the record of debt that stood against us with its legal demands (Col. 2:14). Third, the resurrection assures us that we serve a living Savior who even now is interceding for us. The writer of Hebrews wrote that He always lives to make intercession for us (Heb. 7:25). Paul was even more emphatic when he wrote, “Who is to condemn? Christ Jesus is the one who died — more than that, who was raised — who is at the right hand of God, who indeed is interceding for us” (Rom. 8:34). The One who died for us now lives to intercede for us. When you are going through struggles of any kind, be it adversity that you face, or sin you are struggling with, remember that Jesus is interceding for you. Fourth, the resurrection of Christ guarantees our future resurrection. In his extensive treatment of the resurrection in 1 Corinthians 15:12–58, Paul wrote, “But in fact Christ has been raised from the dead, the firstfruits of those who have fallen asleep. For as by a man came death, by a man has come also the resurrection of the dead. For as in Adam all die, so also in Christ shall all be made alive. But each in his own order: Christ the firstfruits, then at his coming those who belong to Christ” (vv. 20–23). So as you celebrate the birth of Christ this Christmas, remember His birth is only the first of the four major events of His life. Not only can we say, “He is risen indeed,” but we can also say with Paul: “For the Lord himself will descend from heaven with a cry of command. …And the dead in Christ will rise first. Then we who are alive…will be caught up together with them…and so we will always be with the Lord” (1 Thess. 4:16–17). Maranatha! “Our Lord, come!” (1 Cor. 16:22). Permissions: You are permitted and encouraged to reproduce and distribute this material in any format provided that you do not alter the wording in any way, you do not charge a fee beyond the cost of reproduction, and you do not make more than 500 physical copies. For web posting, a link to this document on our website is preferred (where applicable). If no such link exists, simply link to http://www.ligonier.org/tabletalk. Any exceptions to the above must be formally approved by Tabletalk. Please include the following statement on any distributed copy: From Ligonier Ministries and R.C. Sproul. © Tabletalk magazine. Website: http://www.ligonier.org/tabletalk. Email: tabletalk@ligonier.org. Toll free: 1-800-435-4343.